Seeing an implant dentist in Randolph is, for many patients, the start to a better life. Unfortunately, some people avoid this important step because they’re worried about pain or discomfort. Does that sound like you? If so, then we have good news. Most people who have received implants compare the procedure to undergoing a simple extraction. Yet the benefits can last a lifetime. The initial appointment in which the dentist places the implant. You will receive anesthetic and possibly sedatives to make the treatment as comfortable as possible. This is followed by a recovery period of 2-3 months. Once recovery is complete, you’ll return to your dentist to place the abutment, the small metal fixture that joins the implant to the restoration. At this time, your dentist will create a series of images from which the restoration itself will be crafted. The last step is to place the restored teeth. Afterwards, you’ll be able to show off your new smile to the world. The benefits of dental implants go beyond cosmetic enhancement. They allow the patient to eat all their favorite foods, participate in exercise and sports, and enjoy an active social life. The dental implant process, like any form of surgery, does entail the possibility of post-surgical discomfort. In almost all cases, this can be easily controlled with over-the-counter products such as ibuprofen. You may also experience post-surgical swelling. Many patients find that a simple icepack is more than sufficient for managing this problem. Your dentist will probably recommend rinsing your mouth with warm salt water and eating a soft foods diet for the first few days after the procedure. 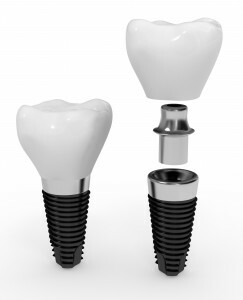 The benefits of receiving dental implants far outweigh the short-term discomfort. That’s because implants are a true restoration for missing teeth, not merely a form of treatment. With implants, you’ll never need to worry about bone resorption, changes to your appearance, or lifestyle limitations. One way to enjoy the benefits of implants along up with the convenience of dentures is to opt for an implant-supported denture. You’ll be able to remove the appliance as needed for cleaning or other personal tasks. Yet you’ll never have to deal with messy adhesives or worry about the product coming loose at the worst possible time. Dental implants are not the best solution for everyone. The procedure does require sufficient amounts of healthy underlying bone to support the restoration. If this is a problem in your case, then your dentist may recommend bone grafts or a different form of treatment entirely. Dental implants make it possible for millions of people to enjoy a renewed smile and a better quality of life. Talk to your dentist about this treatment option during your upcoming appointment. Whatever you ultimately choose, we wish you a lifetime of happy smiles. Dr. Glen Goldstein has been practicing dentistry for more than three decades. He earned his DMD degree from the University of Medicine and Dentistry of New Jersey. A skilled implant dentist, he is a member of the International Congress of Oral Implantology. You can reach his office online or by calling (973) 895-7995.